Associated Students and their partners bring you Earth Week, April 22-26th: Building Resilience in a Time of Crisis. There will be film screenings, workshops, poster presentation, bike ride, and many more activities plus a keynote address by David Cobb to kick things off. See the full schedule at https://associatedstudents.humboldt.edu/content/2019-schedule. Come hear a presentation about the life in Palestine and the United States from Professor Leena Dallasheh who came from Palestine. Wednesday, April 24th from 4-5pm in the Library Fishbowl. Stress relief comes in many shapes and sizes! Find the friendly, furry faces from Therapy Dogs International and get some puppy love on Tuesday, May 14th, 1:30-3pm in front of the Library on the lawn. Join us for ideaFest 2019! IdeaFest is happening Friday, May 3rd, 2-5pm on all floors of the Library! Come see what students and faculty have been working on, the answers they’re seeking, and what they’ve uncovered. And, get a glimpse of the type of research and creative work that’s possible here at HSU. You’ll be impressed! Open gallery viewing of the posters will start at 12:00pm. The reception will be held 2:00-5:00pm on the 1st-3rd floors of the Library. In addition to poster presentations, there will be music, dance, art, and theatre performances. This event is sponsored by the Office of Research & Sponsored Programs, Marketing & Communications, and the HSU Library, in collaboration with the Colleges. As one of 104 grant recipients selected from across the country, the HSU Library will host the traveling exhibit, Native Voices: Native Peoples' Concepts of Health and Illness for a six-week loan this fall, October 9 through November 20. Native Voices exhibit explores the interconnectedness of wellness, illness, and cultural life for Native Americans, Alaska Natives, and Native Hawaiians. Stories drawn from both the past and present examine how health for Native People is tied to community, the land, and spirit. Through interviews, Native People describe the impact of epidemics, federal legislation, the loss of land, and the inhibition of culture on the health of Native individuals and communities today. This exhibit is sponsored by the HSU Library, Department of Social Work, Student Health & Wellbeing Services, J.S. National Library of Medicine, and American Library Association. Opening reception is scheduled for 2-3pm, Tuesday, October 15th in the Library Lobby. Watch this space for more information and related events as yet to be scheduled. 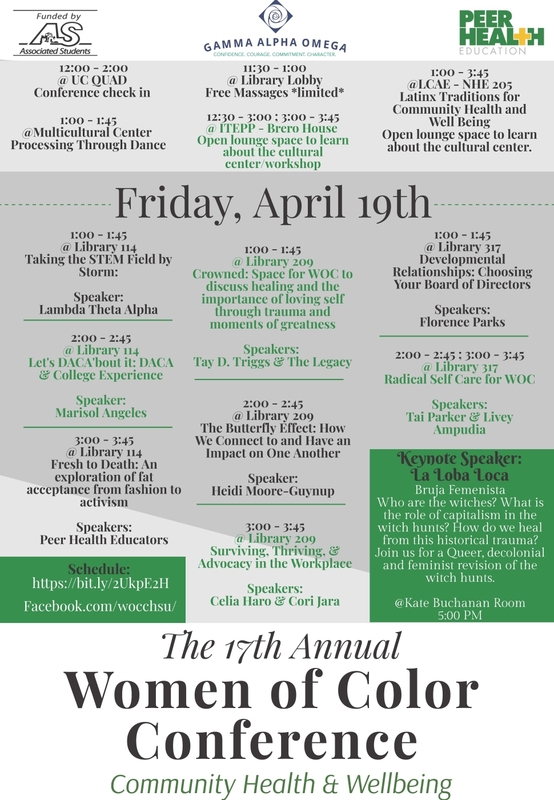 Gamma Alpha Omega, Health Education, and Associated Students present the 17th Annual Women of Color Conference on Friday, April 19th. The theme for this year's conference is Community Health and Wellbeing. 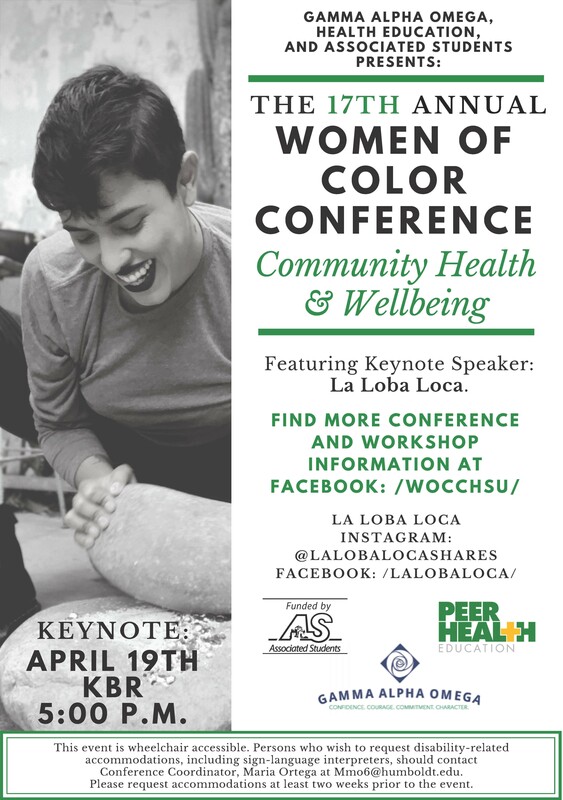 Check in at the UC Quad from 12pm-1pm and check out the various groups tabling, get a free chair massage in the Library Lobby from 11:30am-1pm, enjoy numerous workshops, and cap it off with keynote speaker La Loba Loca in the Kate Buchanan Room at 5pm. Get more information from the full schedule and flyer. Register in advance here. You can also find more information from the WOCC Facebook page and Event page. You are invited to view the inspiring and creative works from the language students at HSU and Arcata High School on Friday, May 3rd, 2-5pm at ideaFest (HSU Library) and Friday, May 10th, 6-9pm at Arts Arcata (Feuerwerker Bldg, 854 9th St.) This exhibit, The World "The way we saw it," showcases photographs from around the globe and writings in different languages, committing precious moments to memory. "This is our world! This is the way we saw it!" You are invited to a Library Luncheon, great way to celebrate National Library Week, and to discuss information literacy & student papers. How do you evaluate sources used on student papers? What process do you use to check citation styles? What tools would you like to see that can make it easier to assess information sources in papers? Citing Insights is a Library Student Project to develop a useful tool for faculty, staff, librarians, graduate & teaching assistants, and tutors to evaluate information literacy and citations in student papers. So please let us know what you want to see. We aim to provide a beta-version this fall. The long-term goals of the project is to build a tool to improve student research and writing. We greatly appreciate your time, hope you enjoy this opportunity to shape a useful tool, and enjoy lunch and the conversations. If you have any questions about the project, please let me know at: Cyril.Oberlander@Humboldt.edu or x3441. 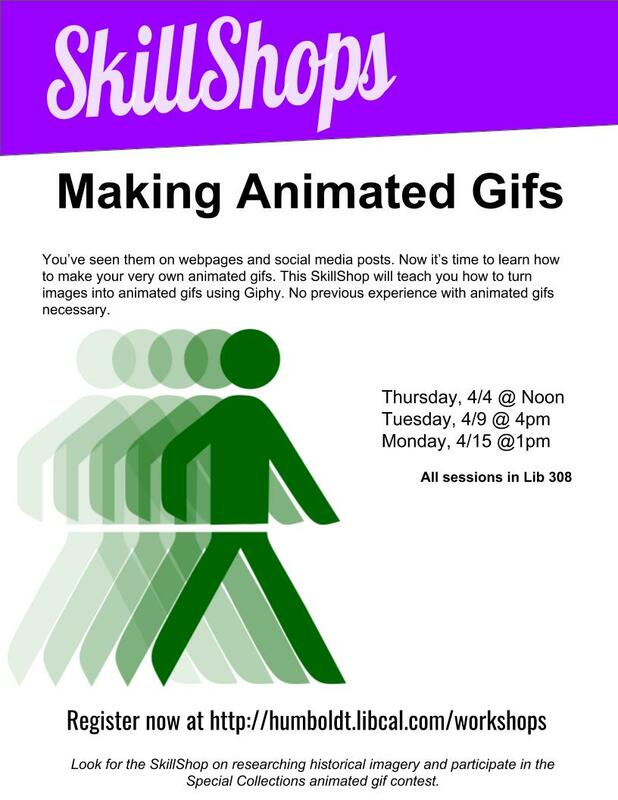 Have you ever wondered how to make an animated gif? 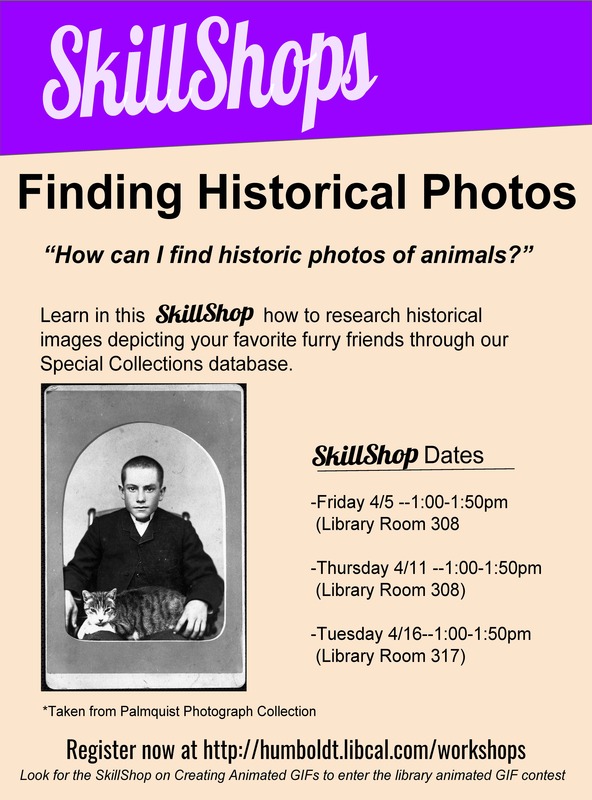 Learn this important skill, use historical photos, and then enter to win the Library's Animated Gif Contest! Submit an original gif using an image from Special Collections by 11:59pm on Friday, April 19th and you could win a fabulous prize! 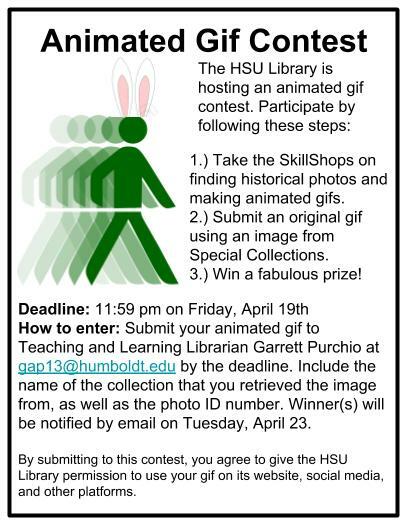 Submit your entry to Teaching and Learning Librarian Garrett Purchio at gap13@humboldt.edu, including the name of the collection you retrieved the image from, and the photo ID number. Winner(s) will be notified by email on Tuesday, April 23. Contact Garrett for more information. Sixteen Awa Odori dancers from Japan will perform their traditional dance, 5-6pm on Monday, April 29th in Kate Buchanan Room. 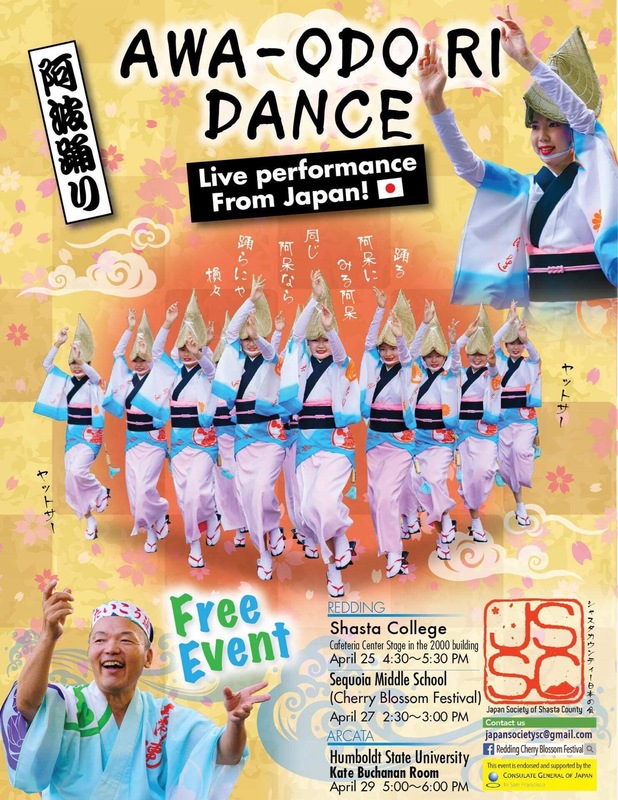 These dancers are coming with the help of Japan Consulate in San Francisco, and the performance is free. They will be performing at Shasta College on 4/25 (Thu), and at the annual Cherry Blossom Festival in Redding on 4/27 (Sat). These dancers will be making a special trip to HSU to share their energetic and fun dance with the help of local Japanese community. The Awa Odori (dance) Festival is held usually from August 12 -15 as part of the Obon Festival in Tokushima Prefecture on Shikoku Island in Japan. Awa Odori is the largest dance festival in Japan and attracts over million tourists each year. Performers wear traditional obon dance costumes and chant and sing as they dance. This is a once in the lifetime opportunity to witness this dance outside Japan, and here on the northcoast. Are you passionate about a specific issue? Are you looking for more creative ways to get your message across? Join Michele Miyamoto of the Learning Center in this workshop on utilizing writing skills to advocate for issues you are passionate about! Learn to teach others about your cause through creative story telling on Wednesday, April 10th at 5pm in the Library Fishbowl, L209. There will be an open mic in the Library Cafe from 6pm-7pm following this workshop. This is a workshop in our continuous series Leadership Lounge. These workshops strive to develop the leadership skills of our students. 2nd Annual LumberHacks Hackathon is Coming! 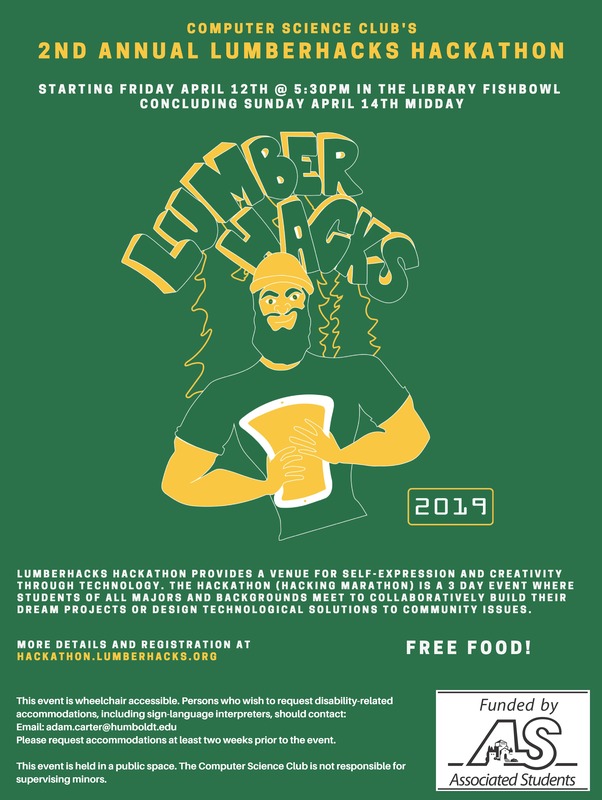 The Computer Science Club invites you to the 2nd Annual LumberHacks Hackathon taking place over next weekend in the Library Fishbowl starting on Friday, April 12th at 5:30pm and concluding midday on Sunday. The Hackathon is a three-day project building competition in which competitors form teams and have the opportunity to express themselves through technology. Teams can build whatever they want over the course of a weekend competition. The Hackathon is a free event where all meals are provided. Furthermore, all competitors will receive a free shirt and the top three teams will earn prizes. Attended by many Computer Science students, the Hackathon will have lots of programmers ready to build awesome projects. Students of all majors are welcome. Non-CS students can be contributors in many different ways: providing project ideas and direction, providing invaluable group leadership skills, providing business input, providing artistic input, providing user psychology input, and much more. Any and all who attend will find a team in which their contributions are appreciated. Want to learn more? Attend the Library SkillShop LumberHacks Hackathon FAQ on Monday, April 8 at noon in the Library Lab, L308. There students can learn more about the Hackathon and ask questions. You can also go to the website http://hackathon.lumberhacks.org/ for more information and to register for the event. Any further questions can be directed to club president Eric Mott at em73@humboldt.edu. As part of the Let's Talk About the Middle East film and discussion series, HSU History professor Dr. Leena Dallasheh hosts a screening of Avanti Popolo (1986). Join us at Richards' Goat on April 4 (Thu) @ 5:30pm! Set in the Sinai Peninsula immediate aftermath of the Six-Day War, the film follows the surreal journey of two Egyptian soldiers, lost in the Sinai desert at the end of the war, trying to make their way home, and as they encounter an Israeli patrol. Israeli General/politician Ariel Sharon opposed this film’s nomination for the Academy Awards, claiming in was "a self-destructive portrait of inept Jews." Celebrate 50 years of Marching Lumberjacks! HSU's own Marching Lumberjacks celebrate 50 years of existence with a performance outside of the Library on Tuesday, March 26 starting at 5pm. Come celebrate with music, light refreshments, and a new library exhibit. Were you a member of the band? Share your memories on whiteboards in the lobby and enjoy the new exhibit. Film Platform is a cutting-edge global digital streaming platform, supplying premium curated documentary films. Film Platform strives to integrate films into academic settings to create robust educational curriculums, provoke debate and inspire change. Films are central to evolving academic curriculums, to match new engagement and viewing trends by students. Film Platform is committed to advancing the next generation of activists by enhancing media literacy. Check it out until May 4th at http://library.humboldt.edu/infoservices/restricted/filmplatform.cgi. Join us on Thursday, April 11 at 4pm in the Library Fishbowl to hear Margot Genger read from her debut book Shift Happens - Breakdowns During Life's Long Hauls. HSU English Professor Emeritus Susan Bennett writes, "Out of desperation to escape the confines of her small Northern California town, Genger breaks every rule of her 1970s social class, gender, and upbringing to become a long-haul truck driver. Shift Happens will make you laugh, cringe, and celebrate as Margo navigates the underground life of long-haul truck driving with 11 different driving partners. She criss-crosses the U.S. delivering everything from Hustler Magazines to Washington State apples - sees both the beauty and the meanness that is America - and eventually realizes what she values in 'home'." To learn more about Margo and her work, visit her website at www.mjgenger.com. The HSU Library is pleased to invite you to meet each of the three candidates for the First-Year Experience and Student Success Librarian position. Each candidate will be presenting a teaching demonstration in the Library and you are invited to attend and provide feedback. Candidates have been asked to provide an open forum teaching demonstration followed by a Q&A session. Please contact the search committee chair, Brianne Hagan (brianne.hagen@humboldt.edu) if you have any questions. Are you interested in the tourism and travel industry? Apply to be a Library Scholar Intern! HSU Library is seeking two Library Scholar Interns to work as a team on a Tourism & Travel Project that runs from March to the end of May, 2019. This paid Library Scholar Internship project will provide a stipend of $300 upon the completion of a short-term project; primarily research and gathering of information and data about tourism and travel for Humboldt County, and developing a resource guide. Team roles and duties will be tailored to the talents and interests of the intern. Maintain an internship log, including experiences and challenges that they encountered over the course of their project. Meet together at least one hour each week. Perform research and interviews to gather resources, develop a resource guide and suggested resources on tourism and travel, eco- and edu- tourism, and other related resources. Gather information from a variety of sources; web pages, news sources, interviews, etc, to understand the tourism and travel interests at HSU and in the region. Write a brief reflection of the internship. Students will work individually and as a team to gain hands-on experience researching, evaluating resources, and developing a resource guide of recommended readings for tourism and travel. For more information or to apply, please send a brief resume, availability schedule, and brief cover letter expressing your interest for this unique opportunity to Cyril Oberlander, Dean of HSU Library at Cyril.Oberlander@Humboldt.edu by March 8, 2019. As part of the Let's Talk About the Middle East film and discussion series, HSU History professor Dr. Leena Dallasheh hosts a screening of Born in Deir Yassin (2017). This screening will be at Richards' Goat, March 7 (Thu) @ 5:30pm. On the night of April 9th 1948, Deir Yassin, a Palestinian village on the outskirts of Jerusalem, was attacked by the Stern Gang and Irgun. They proceeded to commit a massacre that has left a huge mark in the history of the conflict. This film sets to tell the story of the village in its various incarnations, including interviewing some of those who directly involved in the massacre and its aftermath.